"The reports of my death have been greatly exaggerated" as Mark Twain said. Though February was a hard month, full of events, we continue to develop the app and here is the new portion of updates in version 1.12. 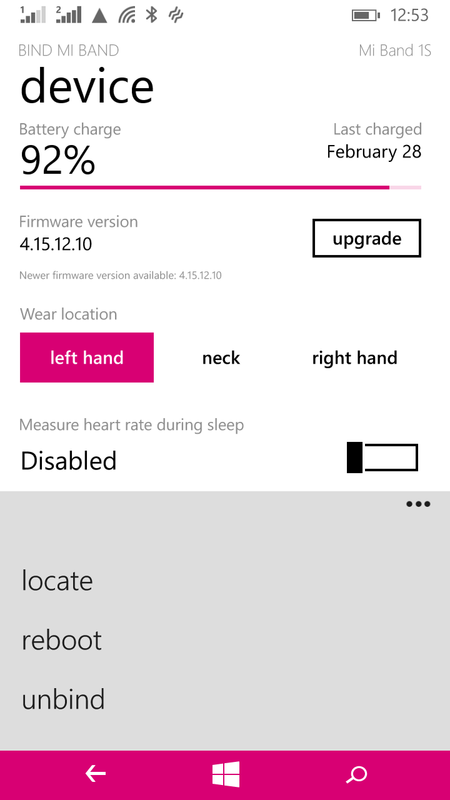 The main improvement: now it's possible to upgrade the firmware of Mi Band with our app. This works for all the versions of Mi Band. We won't be necessary having the latest firmware from Mi Fit, but the version, which we'll have in Bind Mi Band, is guaranteed to be 99% working. Many people complained about issues related to alarms and heart rate measuring. Now this improvement should help them. This feature still can be unstable, but it shouldn't cause issues with your Mi Band in the case of failure. If firmware upgrade permanently crashes for you, try to reboot your band. 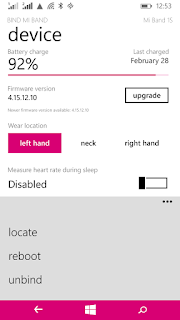 On the device page, in the bottom menu, you will also find new item: "reboot", which will allow you to restart your Mi Band. But be careful: it will vanish all data from your band. So use it only when your band is malfunctioning. Now in the app you will be able to see the model of your Mi Band. Here's a small reminder: only Mi Band 1S has a support of heart rate measuring. And only Mi Band 1.0 has different colors of LEDs. Additional small tweaks, fixes, and layout changes were made, which you may notice. We hope that you will like them. This release was more technical but very important for many users. Further, we will continue working on the new features and hope to get back to you next time already in this month. Wow, nice to see new features and improvements! Firmware upgrade worked Great for me on Band 1.0. Impressive improvement! Thank you all, and keep up the good work, guys! I downloaded and paid for the app and I am happy with the app. As sleep analysis is not available, presently I am not using it and paired my band with my iPad which is little inconvenient. I am eagerly looking for sleep analysis feature so that I can bind my Band with my phone. I do have the pro version of the application. The upgrade works really well. All the functions are now operating. Thank you for all your work, all your prompt responses to e-mails and keep going!! I have paid pro version, and I'm so happy with this app. I would like to see feature with income alerts and notifications from my phone to my Mi Band with vibration. Good work,thanks a lot! Great work Guys! Updated my 1A Band successfully with your app! Thanks! Thank you. I hope for running future. This app is unable to communicate with my 1S after my phone was upgraded to WIN10 Insider Release Preview build while 1S is visible to bluetooth and paired. i dont have any problems with Insider updates. maybe you do hard reset and forgot unbind band? It looks like I've forgot to unbind the band. Do you have any idea on this issue? I used another WP to bind this band and then unbind it. After that my band easily got connected to first WP. It's possible in free also. Just wait for sync to complete.